"Put this in front of the guys during the next game and watch it disappear! It's easy to control the heat by removing the seeds and ribs (the whitish membrane inside the pepper) before dicing to result in a dip that is mild, medium, or hot and spicy, to suit your taste. For a mild dip, remove all seeds and ribs. For a very spicy dip, leave all the seeds and ribs intact. Serve with sliced sourdough baguettes." 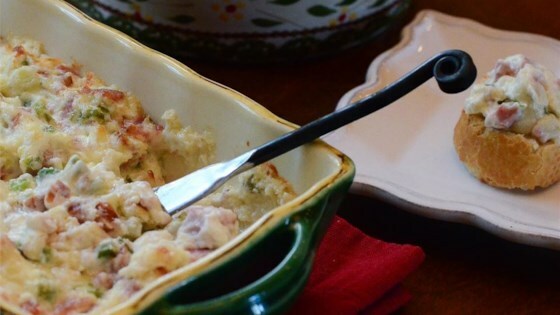 Fold cream cheese, mayonnaise, sausage, green onions, Italian cheese blend, jalapeno pepper, and garlic powder together in a bowl until evenly mixed; transfer to a small baking dish. Bake in preheated oven until hot and bubbling, 15 to 20 minutes. Mine came out very greasy. Swimming in grease, actually. The flavor WAS delicious though. I think next time I'll change the way it's prepared, but definitely not the ingredients. I've made this for several years with jalapeño kielbasa (like it spicy), 3kinds of cheeses, then after cooking I top it off with a thin layer of raspberry chipolte sauce. Killer at parties.